If you’re reading this article you’re probably wondering whether it’s worth it or not to buy a water stone to sharpen your knives. Maybe you’re considering a more expensive sharpening option, such as electric knife sharpeners or sharpening systems. I have received countless emails and feedbacks from readers and costumers at different sharpening levels, and I would like to summarize the main struggles people have when using sharpening stones. I want to start with the most obvious “disadvantage” that stones have. Think about it: you’ll have a simple, hard stone in your hands. It will not sharpen your knives automatically. You’ll have to spend time and effort learning how to use it. You’ll have to keep a more or less fixed sharpening angle, apply the right amount of pressure on the blade, grinding each side of the knife on the stone, while keeping the stone wet. The process is that simple, a couple of sequential steps, but once you’re trying to sharpen your first kitchen knife, it might seem really complicated. You’ll feel scared that you might end up ruining your knife forever. As a result, you could end up not applying enough pressure and your knife won’t get sharp no matter how much patience you put in the process. Keeping a 15-20 deg angle, and applying enough pressure is usually all you need to successfully sharpen a regular kitchen knife. Oh, and also keep the stones wet while you’re at it! Some readers get in touch with me telling me that “Stones don’t work!“. In 99% of the cases, it’s the sharpening technique that is wrong, or is simply not there. If you decide to buy a sharpening stone, understand that you’ll have to learn a new technique. It won’t take long to grasp the basics. 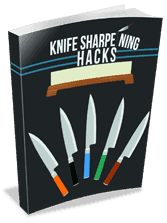 I assure you that you’ll have your knife really sharp after 2 or 3 sharpening sessions, and things will get much easier after that. You’ll work with water, and you’ll sharpen your knives by removing material off the stones. This means that you should do this on a surface you can get dirty and wet. This is not a big disadvantage for most people, but if getting your working surface temporarily dirty is a problem, then consider other sharpening options. It’s really easy to clean the dirt with a cloth, but for some people this can be a drawback. One thing you know for sure: if you sharpen your knives regularly, your stones will get dished sooner or later. This is a problem, because you won’t have a flat surface to work on anymore. 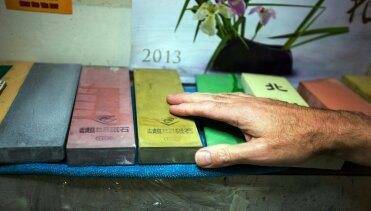 It will be difficult to maintain a stable sharpening angle on a dished water stone. The solution to this problem is simple, you can flatten your stones by using a flattening stone. Basically, you need to be ready to adapt, improvise and all in all be flexible! Always keep in mind that you won’t break your knife or your stone… You need to try again and again, and if the knife is not sharp enough for you, then lower the angle or apply more sharpening pressure. 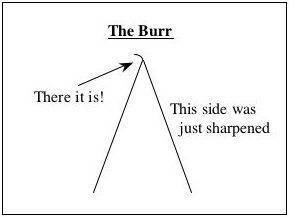 The burr is a good indicator that you’re doing a good job. If a burr is formed, you successfully removed old metal from the dull edge. Raising the burr is essential. It’s also a skill you’ll never forget. And your stone can last for years to come, and needs no maintenance at all… you could leave it sitting in the drawer for a year and it’s going to perform just the same.